I love when a series pulls me in with magic and swoons and everything in between. When I first read A Court of Thorns and Roses I completely fell in love with Feyre and Tamlin and everything about the Spring Court. Then, of course, A Court of Mist and Fury happened and everything changed. 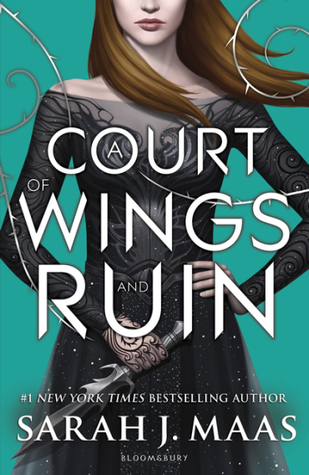 There are so many things to think about with A Court of Wings and Ruin so I'm just going to highlight some of my favorites. I love the guessing games of pretty much the whole book. War is raging all around Feyre and Rhys. Their friends are dying and lands are being destroyed, and they don't know who to trust. I love that, through it all, these two are a strong and united front. There's such a great myriad of characters in this series that you come to know and love even more with this third installment. Even with the second-guessing and the fighting the inner circle of the Night Court is a close-knit group. I seriously went through so many emotions while reading this book. From anger and rage to swoons and sadness. I loved everything about it. I fell back in love with some characters and forgave others for being complete jerks. Of course, you learn to hate some of them too. The ending, to me, was lovely and just what I'd hoped for. I'd love to have a little more resolve for some of the other characters. Hopefully we'll see some more of that in the future.